Reaching the largest audience possible is imperative when a property becomes vacant. Vacant properties are one of the most threatening components to a landlords bottom line. Finding amazing tenants that stay for a long time is the best way to maximize a rental business. 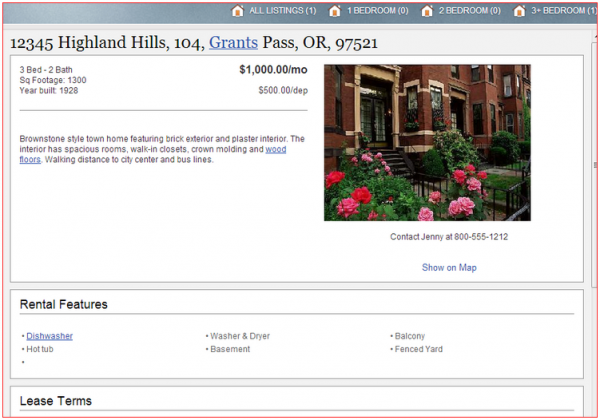 Searching for vacant properties online is now the most common way that current renters seek out available properties. 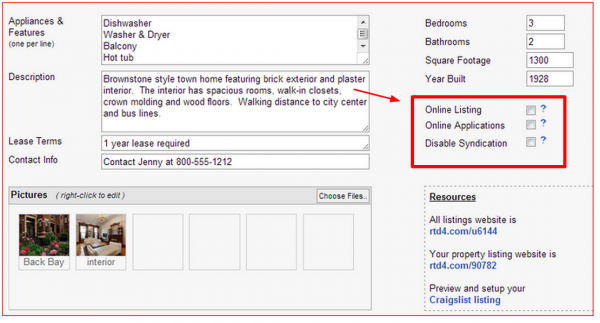 Using Rentec Direct can save you hours creating ads for each of the rental listing sites. Re-creating the same ad over and over again is a hassle but with Rentec’s property management software you can use the marketing feature to easily create, re-use, and publish ads for your vacant properties to over twenty of the most widely used listing sites. Using this marketing feature is sure to help you fill your vacancies which will ultimately increase your rental income. Other tips to get your property rented fast can be found here. By reaching the largest pool of applicants you are able to select the most qualified tenant for your property. Setting up a marketing profile for your rental properties is easy. Simply right click on the property under the properties tab in your account and selecting “Marketing Info” from the drop down menu. From there enter information about your property. Give a succinct description about your property highlighting unique features plus all of the more ordinary details such as number of bedrooms and bathrooms, appliances, price, etc. 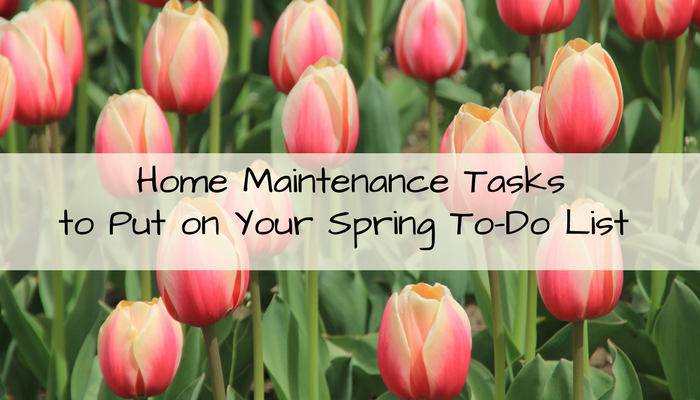 You don’t want to waste your time or waste the time of those seeking a rental so be sure to include some of the policies that may not work out for some individuals such as your pet policy, number of tenants, smoking policy, etc. Be sure to upload a lot of pictures of the property, it’s like online shopping and consumers want to see what they’re “buying”. Pictures are easily organized any way you wish to display them and a cover picture can be selected by right clicking on the image and selecting featured image. 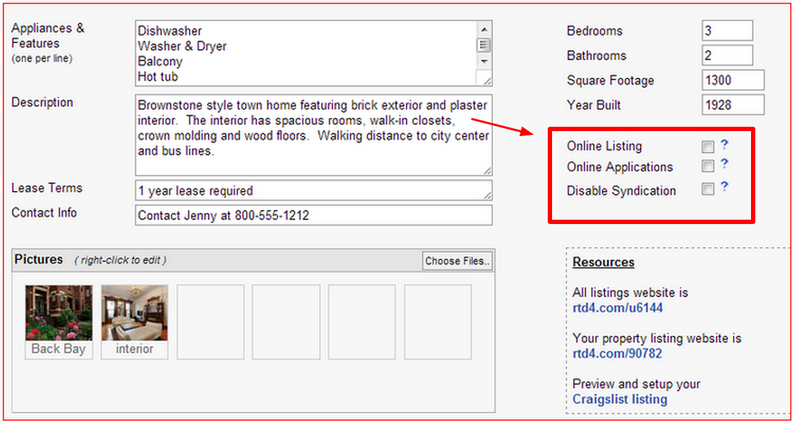 To advertise a vacant property simply check the box next to “Online Listing”. Checking this box will automatically post the property to all of the syndicated sites and if applicable your own listing website. While here you have the option to allow a potential tenant to be able to fill out an online rental application. In order to enable that feature simply check the box next to “Online Applications”. For more information on setting up your rental applications click here. Once you’ve completed the property profile and selected your preferred settings simply “Save Property Profile” and if the property is vacant post your listing. You’re able to use your properties profile via Rentec Direct’s software to post to the rental listing syndication network. 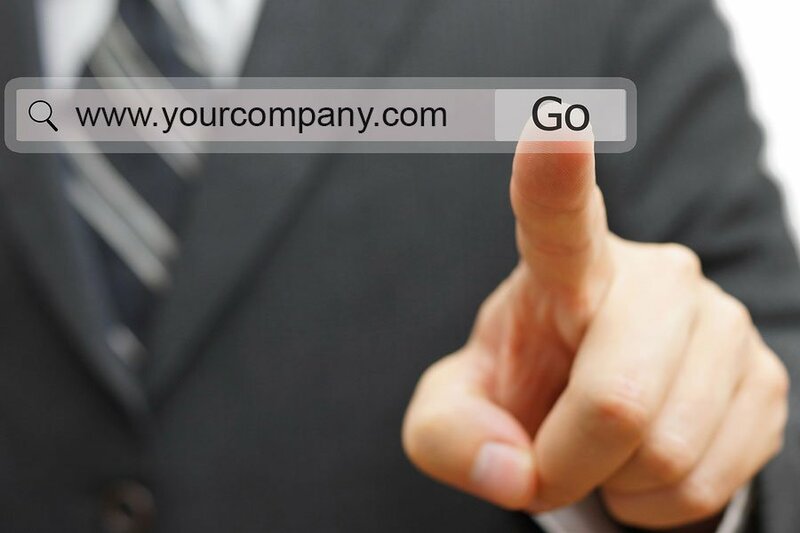 In addition, you can use the unique URL to manually post listings to websites of your choosing. Rentec Direct also includes an “All Listings Website” that will include all of your vacant properties to use on your own website or to send to potential tenants. If you choose to use the unique URL to manually post or distribute your ad it will look like this example below. 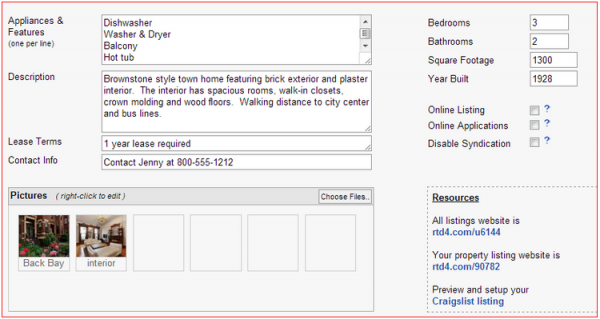 Craigslist has not yet made it possible to automatically post ads through a syndication network but Rentec Direct has created a tool to make the process easier and to make a great looking Craigslist ad. Reducing the time that a property is vacant and saving time by creating a searchable rental listing that can be saved and easily accessed through your property management software is smart business. Automatically publishing your rentals to over twenty online rental listing websites will help you maximize your productivity and your profits.